How do I print with black ink from Windows or my Mac when a color ink pack is expended? When a color ink pack is expended, you can temporarily continue printing from your computer using black ink. Replace the expended color ink pack as soon as possible for future printing. 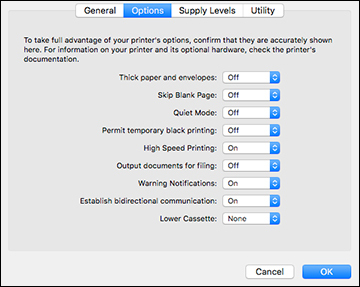 If you see a message during printing telling you that you can temporarily print in black ink with an expended color ink supply unit, you can cancel your print job and select settings to print on plain paper or on an envelope.